The chimney that a couple thousand chimney swifts stuffed themselves into. As 50 or so people stood looking up at the darkening sky with anticipation, a vortex of several thousand chirping chimney swifts swirled overhead in their nightly communal roosting ritual during fall migration, reminding at least one viewer of the bat scene “somewhere around Barstow” in Hunter S. Thompson’s Fear and Loathing in Las Vegas. The humans gathered on this Friday evening at an abandoned school across the street from Lake Okauchee in southeastern Waukesha County to witness the amazing roosting display had spent the day in a Pewaukee hotel ballroom, the first day of a two-day conference called S.O.S. for Our Flying Bug Eaters: Addressing Declines in Wisconsin’s Aerial Insectivores. The conference was convened by the Wisconsin Bird Conservation Initiative and Bird City Wisconsin, with a number of other sponsors that included the Wisconsin Department of Natural Resources and the Wisconsin Society of Ornithology. 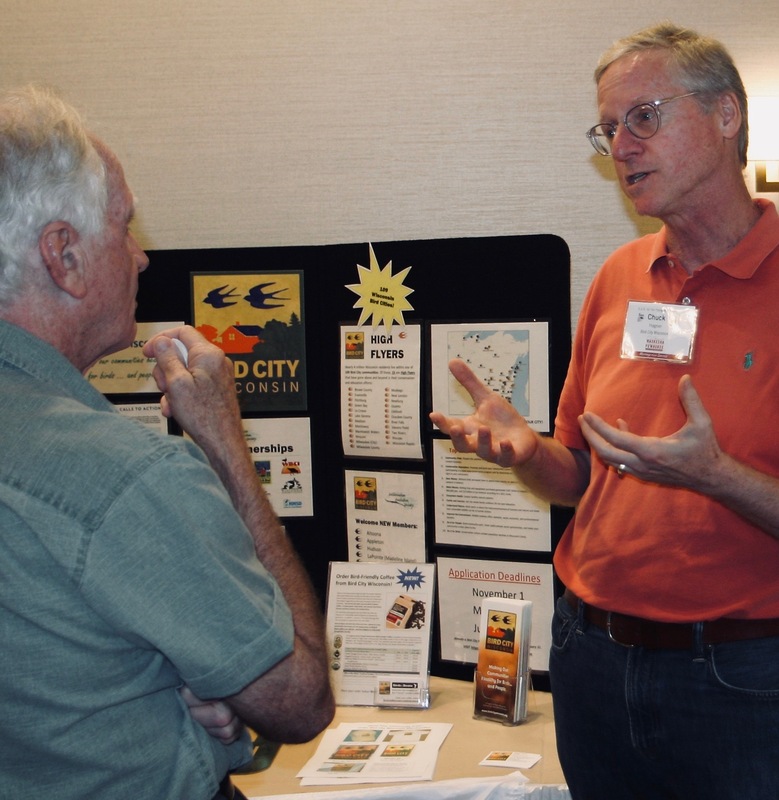 Chuck Hagner, the new director of Bird City Wisconsin, talks to a conference attendee during a break. Before taking this position, Hagner spent 16 years as editor-in-chief of BirdWatching magazine. After a fact- and science-filled day of presentations about the decline of flying bugeaters inside, this field trip some 20 minutes from the conference hotel was in the great outdoors watching nature’s incredible story unfold. Loss of habitat is one of the many challenges facing aerial insectivores such as the chimney swift. 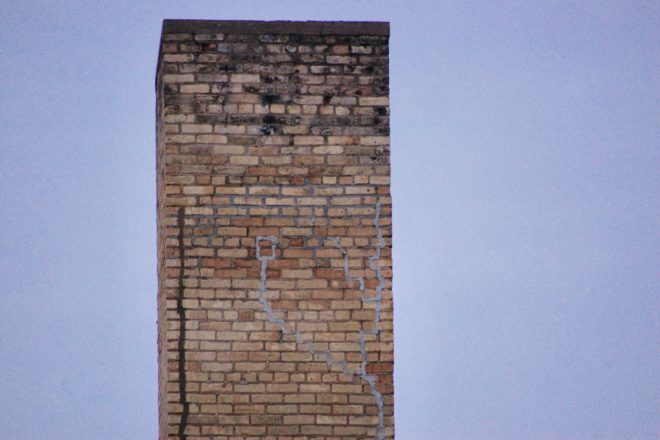 In their case, many chimneys on old buildings have been demolished, or have been capped, or modern chimneys built with materials other than brick and mortar that don’t allow the swifts to roost inside of them. Conference emcee and Wisconsin Department of Natural Resources biologist Ryan Brady, who is stationed in Ashland, Wis., was obviously moved by the sight of the chimney swift vortex. As dusk descended into night, the swifts began dropping into the chimney. The vortex grew smaller until just a handful of individual birds flew around the area sentinel-like. It feels like we chosen few have just seen an ancient sacred ritual, when, in fact, it’s just another night for the chimney swifts. Nevertheless, it left one feeling wide-eyed, gobsmacked and fully satisfied as a conference attendee. Seeing this gave true meaning to all the data presented during the daytime sessions. It also represents why all these people are so passionate about bird conservation. Spotting Bird City Wisconsin founder Carl Schwartz among the bird-watching crowd, it seemed appropriate to get his take on this thing he seems to have wrought. Humble – and tall – man that he is, Schwartz immediately began scanning the crowd for a more likely interviewee. He named a few people. Sure. All good people. But you are Carl Schwartz, who, besides having impeccable conservation credentials and leading Bird City Wisconsin through its first five years, spent your life in journalism, retiring in 2009 as senior editor for national and international news at the Milwaukee Journal Sentinel. One of his many conservation connections includes the Door County Land Trust. Schwartz said while this roosting site at the abandoned school was known by birders, no one expected so many birds to be present. Professional bird counters have a system for counting, and the number 2,100-some was being bandied about for this particular roosting colony. 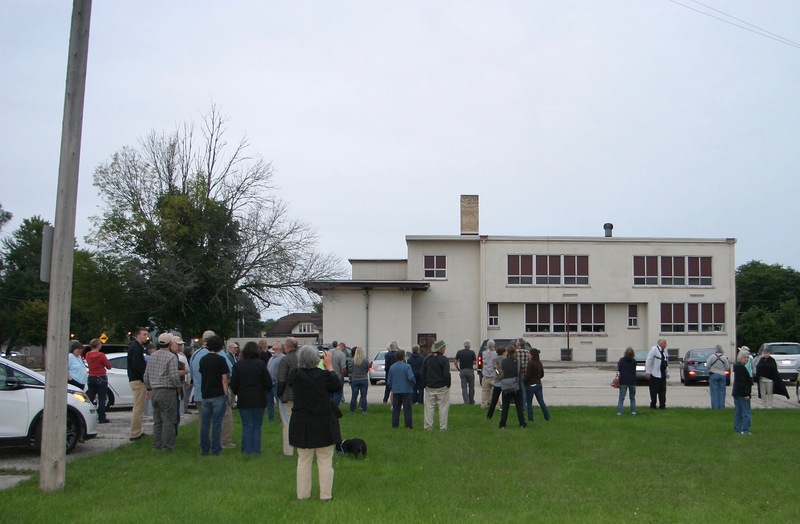 Conference attendees gather the evening of Sept. 7 at this abandoned town school in Lake Okauchee in southeastern Waukesha County to watch the amazing roosting ritual of chimney swifts. Photos by Jim Lundstrom. “It will vary from night to night because this is a stopover site on their migration, a communal roost,” Schwartz said. An overriding theme of the day’s presentations was that despite all the data and study, there is still much we do not know about the natural world. Take, for example, birds. And that was really the call to action message from the conference – more data needs to be collected to understand the challenges facing aerial insectivores. The first presentation of the day was by Dr. Pam Hunt of New Hampshire Audubon, who talked about the risks and declining numbers of chimney swifts, Eastern whip-poor-will, bank swallow and other species that spend more time in the air than on terra firma. Her message – there is no one clear threat. “Every species is going to have a different story,” she said. What looked to be the most esoteric item on the agenda turned out to be the most fascinating as Dr. Robb Diehl of the U.S. Geological Survey discussed the relatively new concept of considering airspace as habitat. Diehl first wrote about the concept in 2013 and since then other scientists have gotten on board. The premise is a simple one: “We should be thinking about airspace in the same way as land and water areas of our earth moving forward,” he said. He then pointed out several aerial insectivores such as the great frigatebird, which can stay in the air for two months, or the Alpine swift which can stay aloft six months, or the common swift which holds the record for staying aloft for 10 months. And, he added, that is not even counting the trillions of insects that live in the atmosphere. He pointed out that about 20 percent of threatened or endangered vertebrates are aerialists, yet we make no allowance for aerial habitat in our environmental law. He proposed the idea of airspace reserves for the future. They would not have to be static reserves as on land and water, but could be dynamic, responding to the patterns of the creatures who rely on the airspace to exist. Sarah Warner, who works in endangered species recovery and environmental contaminants with the U.S. Fish and Wildlife Service, presented on Pesticides: Heeding Rachel Carson’s Warning. She ran off a list of threatened pollinators that includes 36 butterflies, 20 other insects, 22 bats and four mammals. Like other speakers, she said the pressures are many on the listed insects, including land use, habitat degradation, weather and climate change, which is causing a mismatch between insect hatching and bird migration arrival times. “There’s never just one pressure risk or threat, but multiple threats acting together,” she said. She named the many ways the tens of thousands of registered pesticides are introduced into our lives, everything from agricultural herbicides and fungicides used to control crop pests to flea and tick collars on pets to rodenticides used to kill mammalian pests. “The choices that you make daily are very important and you can impact and influence the issue,” she said. William Mueller, director of the Western Great Lakes Bird & Bat Observatory, showed a series of sobering graphs of the decline of certain formerly ubiquitous species in Wisconsin, including the common nighthawk, Eastern whip-poor-will, purple martin, chimney swift, bank and barn swallows.